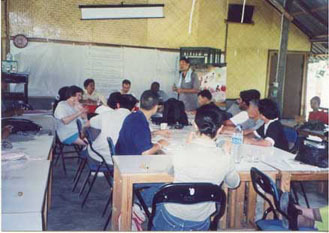 Prior to the inaugural conference of ESCR-Net, representative of various social movements had the opportunity of taking part in an important exposure program-the Solidarity Exposure Visits- organized by Assembly of the Poor with the collaboration of other local organizations and ESCR-Net. 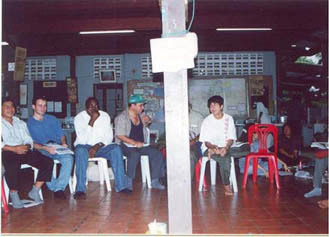 The visits enabled groups to witness first-hand and share local struggles for ESCR; exchange grassroot strategies to advance these struggles; and build solidarity. 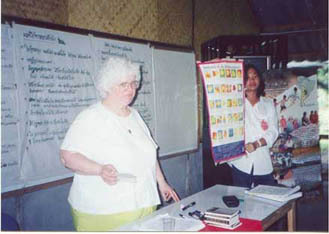 Participants were split into three groups, each one visiting a different region of Thailand. One group visited the Prae and Lampoon provinces in the North of Thailand to witness the potential impacts of the construction of the Kaeng Suea Ten Dam. Another group visited the North-East of the country - Ubon Ratchathanee and SriSaketProvince- where the Pak Mool Dam and the Rasee Salai Dam are located. A third group headed off to the South of Thailand in the PrachuabKirikhanProvince where communities oppose the construction of the Thai-Malaysian gas pipeline. One of the participants to the exposure visits, Ms. Suzanne Shende from Comité de Emergencia Garífuna de Honduras, put together an exciting travel diary and kindly agreed to make it available to everyone. The diary is a great account of of the experiences that she and her travel companions had while visiting the North of Thailand. Arriving tired but excited, most after three days of travel, the international activists of the Solidarity Visits were immediately welcomed by the wonderful hospitality of the Thai hosts. 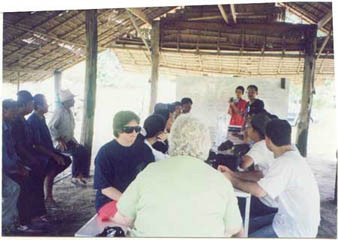 Here, eating at a community center before the orientation and splitting into the 3 groups for the regional visits. We received an orientation in Bangkok to prepare us for the visits to three different regions, to share with people involved in various struggles in Thailand. The preparation and effort by Asia Forum, Assembly of the Poor, Friends of the People, Office of the Study of Human Rights and Social Development, the ResourceCenter for Peace and Human Rights, Dignity International, the ESCR Net and others was excellent. In Prae, the group that went to the north for the Solidarity Visits learnt about the long struggle the people have waged against the construction of the planned Kaeng Sue Ten Dam. Later, Kailash Awasya informed us about a similar struggle, the grave situation of the Rio Narmada Dam threatening thousands of people, their towns and livelihoods, in India. The Kaeng Sue Ten dam is a 'mega-project', supported by the World Bank and TransNational Corporations, against which the people of Thailand have been fighting for years. The residents, like people around the world, are resisting a harmful vision of 'modernization' imposed upon them by international financial institutions that would lead to their losing their lands and livelihoods. 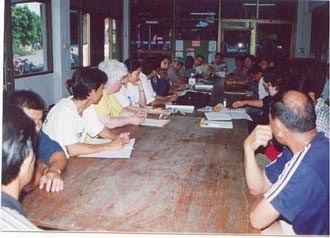 The international activists met with the Thai organizers who are fighting the dam which would flood their villages. They seek to have the Communal Forest Law enforced, so that they can continue to protect and sustainably use the forest they have conserved over the years. Our journey to see the forest the Thai people are protecting began in the back of a pickup truck. 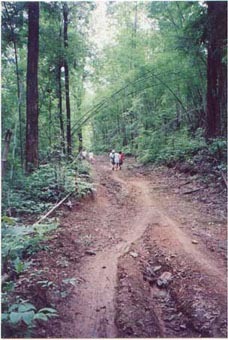 The government has declared this forest, with which the local people have lived in harmony over the years, a "Protected Area", and in so doing, keep them from having access to it. 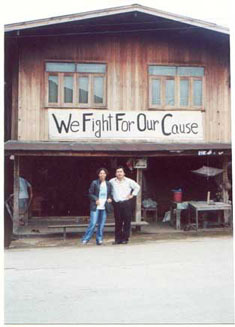 We continued by boat to the forest, which the Thai people are fighting to protect. 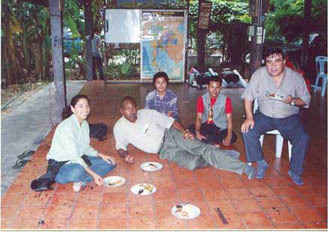 The international group which visited the north included, left to right in this photo: Adelar Cupsinski of the MST (Movimiento de Trabajadores Rurales Sin Tierra) of Brazil, William Chapantier who works on migrant issues in the Dominican Republic, Wilder Sanchez who works on land issues in Peru, Silvia Espinoza who works with indigneous rights in Bolivia, Tito Puanchir who works with indigenous rights in Ecuador, and Mary Smith, translator for the deaf from the U.S.
People's entire livelihood and way of life is threatened by the government's attempt to prohibit access. Trees are believed to have spirits and are protected by rituals. Here, one is wrapped in the material used by Buddhist priests, as you can see on the tree on the right of Wilder and Bernard Martinez. 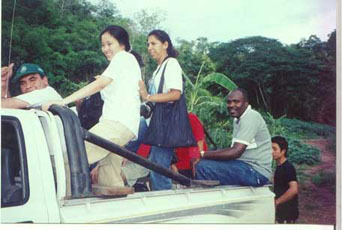 Bernard works with the peoples of African descent in Honduras. 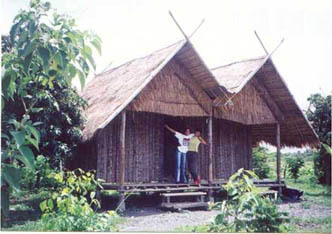 The traditional way of life is closely connected to the forest, which is the 'supermarket' for people here. It is used in a sustainable way as a source of fruit, meat, vegetables, mushrooms, leaves, seeds, roots, herbal medicines and artisan materials for personal use/consumption and sale. Local residents have protected precious hardwood trees, like this one. They seek not only the implementation of the Communal Forest Law which they fought hard to have passed, but also formal communal titles for their land. 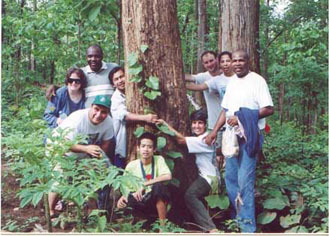 Lower right hugging tree is Suzanne Shende who works in Honduras with the Afro-indigenous Garifuna in the Comité de Emergencia Garífuna de Honduras. 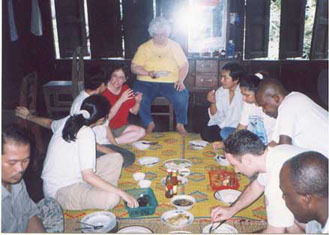 We were able to sample some of the foods harvested from the forest, and we began to learn about, and experience for ourselves, something of Thai culture, customs, food .... Anytime was a good time to share experiences, strategies, histories, songs, perspectives and stories -- in the bus, on the trek up the mountain, but especially during a delicious Thai meal! 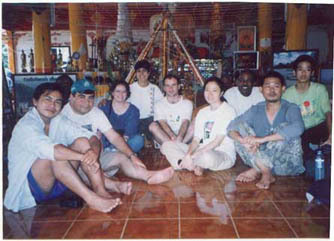 For most of us in the international group, it was our first time in a BuddhistTemple. 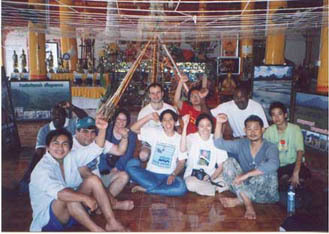 Our knowledgable and wonderful Thai companions Noi and Ben are in the front row, from the right to left. 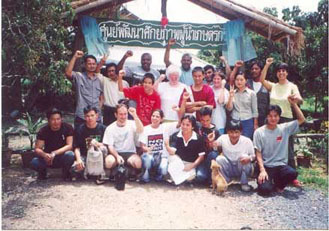 Earlier, Thai activists had taken the international group to see the struggles of the urban poor, and the 2nd group visited the Pak Moon Dam struggle. Behind us in the temple are the posters showing what would be lost if the dam construction is allowed to go ahead: the land, the crops, the villages. 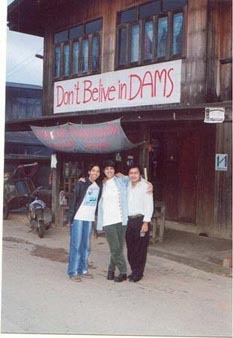 There were also posters documenting the huge marches people had mounted to protest the dam. Among all the social movement activists, we talked about strategies like publicity: photos, video advocacy, press, etc. 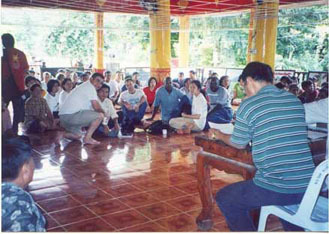 The town meeting in the BuddhistTemple was another educational experience for us. 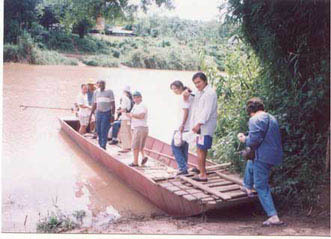 The residents discussed the feasibility of the local whiskey production, which was under attack by the government. They talked about resisting pressure from the big liquor industry and the government to shut down, but also the need to evaulate the environmental impact of possible increased production. Much of what the local Thai people discussed in the town meeting in the temple mirrored issues we all face in our struggles back home: how to offer economic alternatives to the young people so they aren't forced to to leave for the cities, how to protect the land and the traditional way of life, how to defend the community against exploitative and misconceived mega-projects. We met with farmers of the Northern Farmers Federation who are recovering lands to farm rice, mangosteen, longan, lycheer and rambutan. In one case, 57 farmers were arrested when they brought unused land into productive use. We discussed the strategies we need to have in place when we recover land: public education and mobilization; a publicity and press plan; legal representation; support from artists, students, academics and other movements, links to supportive politicians and a strong internal organization... Linking land recovery to the other struggles is vital, including that of the urban poor, the struggle against foreign debt, pricing of products, the environment, etc. 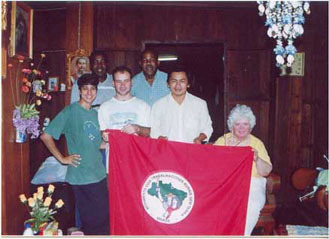 With the Northern Farmers' Federation and the MST flag. MST shared many experiences: that after achieving a land takeover, the people stay active in a united struggle, helping others get land but also organizing for improved production, fair prices, electricity, water, roads, houses, education, health care, etc. Groups like Via Campesino spoke about the efforts to limit the amount of land which a single person can own, and to increase the percentage of the state budget which goes towards agricultural production (instead of, say, military or servicing foreign debt). Where we stayed at the training center. 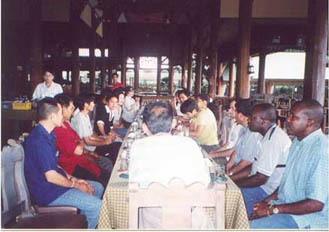 Much of the valuable sharing happened outside of the formal activities as well. We learnt about MST's strategy to take over land one day, and have people so highly trained and organized that the following day, when the press arrive, there are already houses built complete with flowers planted in front. Being aware of the need to present visual evidence of the society we want to create, they clean the streets as they protest through a city, or take a day to donate blood. We did a presentation for the Federation of Northern Farmers. Here, Louise explains about the discrimination against, and the struggle of, deaf people. 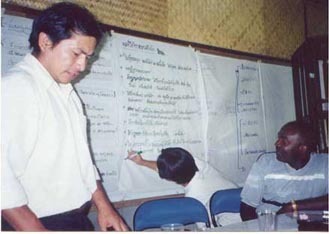 Other strategies we shared include the importance of massive participation to push social change; the need to have a broader social vision that undergirds the objectives and campaigns (i.e., MST's objectives of agrarian reform fit its vision of socialism); the necessity of political, ideological and educational formation of activists, to be better activists and also teachers, doctors, lawyers, and politicians with a commitment to the people, etc..
Tito, William and Tom continued with the presentation, explaining that we must have democracy and broad participation within our movements, in part to ensure that leaders cannot be manipulated, isolated, coopted or bought off. We have to convince people in general that these issues affect society at large, not just a specific group. And we must ensure the equality and genuine participation of women at all levels of decision making and action. Finally, we have to get people committed to the same goals into political power - while realizing that this does not mean power has changed in the economic structures, as in the case of Lula. 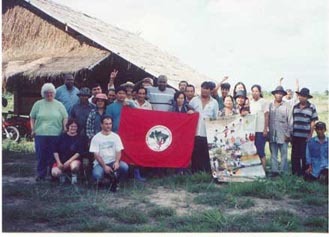 Noi, standing, and the Thai alles emphasized the need to transfer knowledge, for example, of human rights agreements, to the people. They, like other struggles globally, took advantage of a moment of general social uprising in opposition to dictatorship to push for broader social changes. Also, the Thai activists like the rest of us stressed that we have to decide what will be the basis of our development: agriculture, or other routes which cause harm to the people, like oil and gas, mining, huge dams, unbridled tourism? These are often what are imposed on us by transnational corporations and international financial institutions. We should not be trying to win at any price, we must always follow our priniciples and ideals. 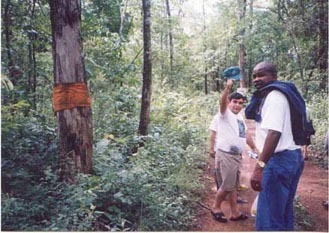 The Thai allies, international group, and puppy at the training center entrance. In our discussions there, as well as ones later with Renji Joseph from India, we talked about how to sustain long-term protests. In Brazil and India, everyone gives part of their harvest to the protestors, and also to the families left behind in the villages. Another similarity in the 2 countries is their work towards self sufficiency in the movements - both raise food, use traditional medicine, and grow cotton to weave their own cloth to make their own clothes. So there are more resources for necessities and the struggle, and less consumerism and dependency.